Last Saturday we had a class session to make our Bucket Brigade masterpieces! We had a great group that wanted to take on the challenge and learn to sew with Stiff Stuff to make a 3-dimensional "quilt" for a change. We had some buckets all the way done by 4:00 and the rest were closing in on the finish line. All the ladies were good sports and ready to learn something new, which makes for a fun group. I really liked the variety of colors and fabrics chosen. These were the large size of the 4 included in the pattern. They are big enough to hold the cat that will lay claim to the front bucket! And no, no one had a hole in their bucket and no one kicked the bucket! Bucket Brigade pattern and Stiff Stuff available at the store! Meanwhile, behind the scenes, there is much work going on to get kits ready for the Quilt MN Shop Hop (starts 7/31). 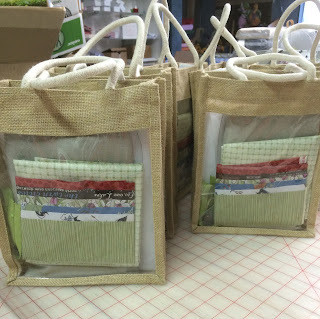 Debbie found these great burlap bags to package some of the kits, don't they look great?! Can't wait for the "big reveal" when Shop Hop begins, we have some great samples and inspiration for you!